Hot Pepper Mustard Recipe - The Secret Is Revealed! Over the past several years, many of you have asked us for our Hot Pepper Mustard Recipe. Well, until now, that recipe has never been shared, not even with Jim! I first had hot pepper mustard when I was in my early 20’s at a local restaurant. The funny thing was that it wasn’t even on the menu! A local farmer brought in a jar that his wife had made for the staff to try. I just happened to be close enough to hear the conversation and quickly became intrigued when I heard everyone raving about it. I struck up a casual conversation with the farmer, hoping to find out more about the popular, homemade condiment. After a little small talk, he offered me a taste. I hesitated and turned down the original offer as I had never been a fan of standard yellow mustard. Before I could even finish my apologetic denial, a small grin came across his face as he promised that I would like it if I just gave it a chance. After being convinced by both he and the staff, I reluctantly picked up a pretzel and dipped it in the thick, yellow sauce. One bite later and I was in love! I knew I had to replicate that exact same taste for my family and friends to try. After a few trial and error batches, I had the perfect recipe! A spread that is as thick as custard, sweet as jam, and packed with a ton of flavor with a slight kick of heat. Each year we have family and friends knocking on our door in hopes that we have an extra jar or two to share. It has become so popular that I make an extra 24 pints just for gifts. 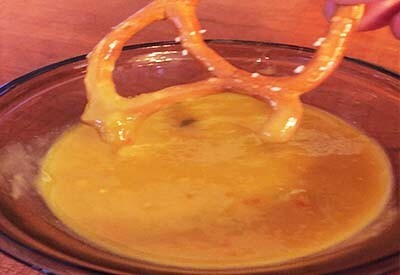 We LOVE to dip pretzels in the hot pepper mustard! We use this hot pepper mustard not only as a dip for pretzels, but also as a condiment spread which pairs quite nicely with brats, sausages, and even on hamburgers. We have now replaced the mayonnaise in our tuna salad and deviled egg recipes with this mustard as well. As with anything that tastes this good, there is one dietary downfall – the amount of sugar required. It calls for as much sugar as a standard jam recipe. I have tried making it with honey but the flavor just wasn’t the same. I have decreased the amount of sugar in my original recipe to the lowest point possible without compromising the taste. So there you have it! Now Jim can help me make more this week! Click HERE to see our other most popular Canning/Preserving Recipes. We use hot banana peppers to give the mustard an extra kick! 1. Seed and chop peppers into fine pieces. *We use the Hamilton Beach Food Processor to complete this task in a fraction of the time. 2. Place peppers in a large stockpot. Add the remaining ingredients and stir. 3. Bring mixture to a boil, stirring constantly. Boil for 5 minutes. Continue to stir to prevent the mixture from sticking to the bottom of the pan. 4. Place in warm, sterilized pint jars, leaving 1/4 inch head space. Wipe rim and add warm lid and finger tighten the ring. Place in hot water bath and process for 10 minutes (adjust for altitude). Seed and chop peppers into fine pieces. *We use the Hamilton Beach Food Processor to complete this task in a fraction of the time. Place peppers in a large stockpot. Add the remaining ingredients and stir. Bring mixture to a boil, stirring constantly. Boil for 5 minutes. Continue to stir to prevent the mixture from sticking to the bottom of the pan. Place in warm, sterilized pint jars, leaving 1/4 inch headspace. Wipe rim and add warm lid and finger tighten the ring. Place in hot water bath and process for 10 minutes (adjust for altitude). oldworldgardenfarms August 8, 2017 October 8, 2018 Canning/Preserving Recipes, Recipes, Sauces Dressing Jams Misc. ← Farm To Table Winners – And How Should We Decorate The Table? Help! I made this recipe and it is delicious. I had a few little lumps just to the immersion blender to it. Solved the problem. Now I have to find ways to use it. 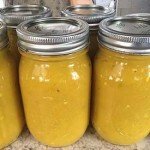 I found another hot pepper mustard that is almost the same as your on allrecipes.com and many of the reviewers said that they had a hard time with lumps. I was wondering if you have had the same problem? Thank you for sharing. I have to admit that little teaser comments on your blog have had me curious about this secret recipe. I also was thinking of the flour, having only recently read that it is never to be canned but sometimes is. My question is regarding the banana peppers. I am not familiar with them and a search suggested that there is a mild and a hot version and I wondered which were used in your mustard? My plan is to make it right before I want to serve it and perhaps to make a smaller (halved?) 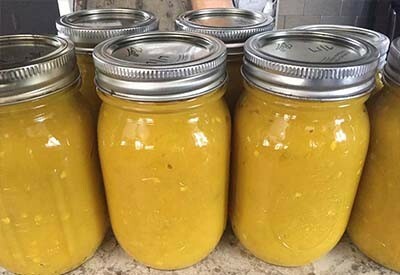 recipe and then distribute it to my family to keep refrigerated and use it without canning. I don’t imagine that freezing would work. I wonder how one goes about having a recipe tested and approved? Awesome! Thanks for your answer. I’m still fairly new to canning and am a total rule follower. I can’t help it, it’s in my blood! I may go ahead and try it anyway. Or, parse it down to a one serving version to try fresh. Love your website and have used many of your gardening tips. My potato crate is almost ready to harvest! Keep up the great work!! I agree with you on the general rule of flour in the canning process, that it is typically avoided. Although I can not find an extension office recipe or a USDA recipe that is exactly the same as this recipe that has been tested, I feel comfortable feeding this to my family and friends as written. Of course, that is totally up to you. I have been making this exact recipe for years and have made several hundred jars without an issue. It is important to use all-purpose flour (not wheat or self-rising) and to make sure there are no clumps. It is also as important to boil it for the entire time and stir constantly so the center of the mixture is heated thoroughly. You can omit the flour and have a thinner sauce if you prefer. Thank you for asking in a kind way! I see this recipe has flour in it. Usually, flour is not safe to can, but I know it can be ok in a tested recipe. Has this recipe been tested for safety with the flour? I’d love to make it, but want to know it’s a safe recipe. 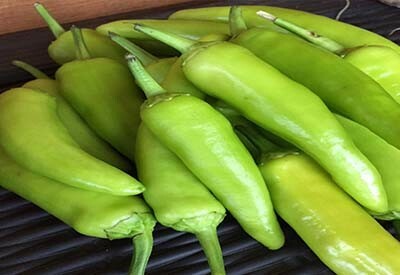 Could you substitute a different pepper for banana peppers? oooohhh thanks for this recipe!